Shingles is a skin rash caused by re-activation of the varicella zoster virus (VZV), the virus responsible for causing chickenpox. The virus can remain dormant in nerve roots for long periods of time, sometimes decades, before erupting again in people who have been infected with it. Shingles usually appears as a rash on a specific area - most often running in a single band across the side of the body or the face. It is normally not dangerous (unless it affects the eye or occurs in immunocompromised people), but can be highly uncomfortable and may lead to unpleasant complications. The active stage begins a few days after the prodromal stage. A painful, irritating rash with blisters can appear anywhere on the body, but typically shows up as a band or strip only on one side of your body or face. The blisters that form are filled with clear fluid. The fluid may turn cloudy after a few days, then turn yellow and dry up, leaving dry scabs. Overall, the shingles rash usually heals up within two to 4 weeks. 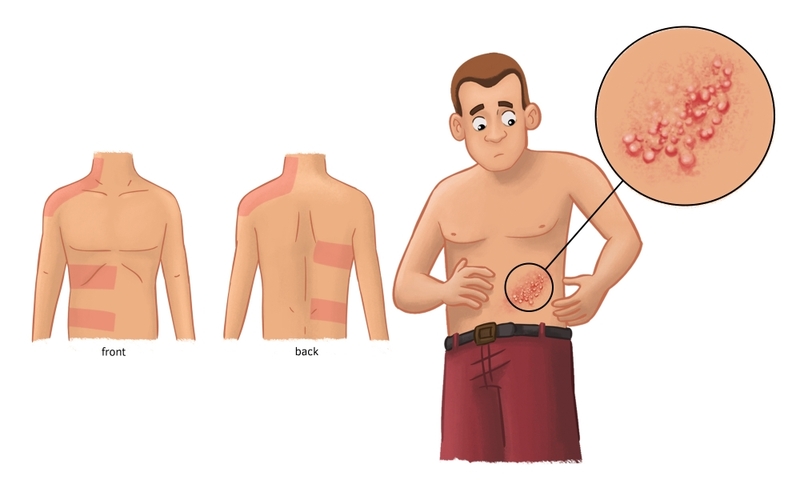 Shingles appear across the body as a rash with blisters. 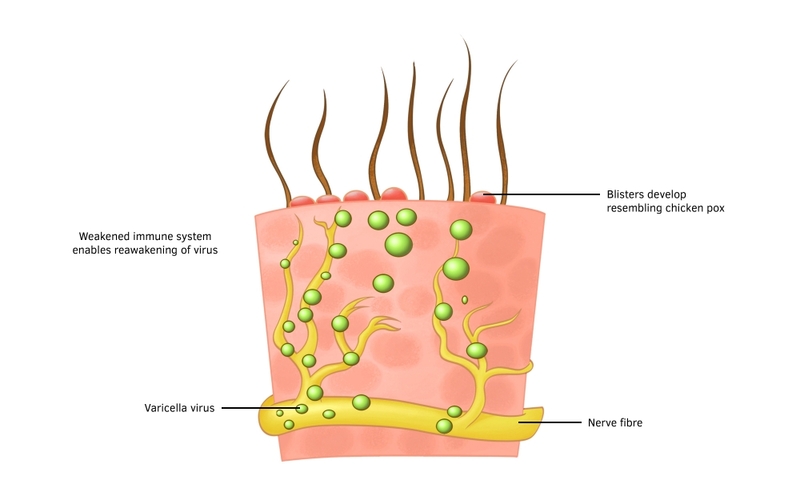 The varicella zoster virus in the nerves causes shingles. In addition, shingles can also develop in newborn babies whose mothers were infected with chickenpox during pregnancy. When you have shingles, it is possible to transmit the VZV to others who have not been infected with the virus before. If this occurs, the person who is infected will develop symptoms of chickenpox rather than shingles. To prevent infecting others when you have shingles, you may be advised to keep the rash covered with clothing or dressings until the blisters have all crusted and become dry scabs. Contact with the fluid from the blisters is the only way to pass on the VZV virus when you have shingles. The polymerase chain reaction (PCR) test involves taking a swab of the fluid within the blister. The tiny amount of viral DNA can be extracted from the sample and amplified using the PCR technique, enabling positive identification of VZV in your body. PCR is a very sensitive method for detecting the virus and is usually available within days of the sample being collected. Shingles may be treated with anti-viral medication, but this may not be recommended in all cases. The medication, if administered early on (within 72 hours after the rash starts), can ease the symptoms and aid the healing of blisters as well as reducing the likelihood of post herpetic neuralgia - a condition that may cause long term pain after a bout of shingles. Your doctor may prescribe pain-relieving medication to help with the pain that often accompanies shingles. Calamine lotion and wet compresses applied to the rash can help soothe the irritation. Good hygiene – keeping the area clean and not scratching – can help prevent further infection of the exposed blisters and avoid complications and scarring. Complications of shingles appear in about one of every 10 cases. About 5-10% of cases may develop a weakness in their arms or legs.3 The complications are more likely in people who are older (over 50-60 years), or have weakened immune systems. The most common complication of shingles is persistent, highly unpleasant pain and itchiness that remains after all other symptoms have cleared up. This is known as post-herpetic neuralgia. It normally ends after a few weeks or months, but in some cases it can last longer and even become permanent. Post-herpetic neuralgia is much more common in older people. In people whose immune systems are weak, there is a danger of the virus spreading further, leading to inflammation in the liver (hepatitis), brain (encephalitis), lungs (pneumonia), spinal cord (myelitis), gut or the blood vessels. These complications can, in extreme cases, be serious and even life-threatening. If the shingles rash develops around the eyes (herpes zoster ophthalmicus), it may cause eye inflammation and vision problems unless treated. Ramsay-Hunt syndrome occurs when the virus infects certain nerves of the face. It can affect the ears, causing hearing and balance difficulties, dizziness, paralysis of facial muscles (Bell's palsy) and ringing in the ears (tinnitus). It can also cause loss of taste sensation. A weakness in muscles of the arms or legs (zoster paresis) occasionally appears as a result of shingles. A bacterial infection of the rash can cause skin scarring. Unless complications ensue, shingles goes away after a few weeks. A herpes zoster vaccine to protect against the virus is available. It provides about 50%-70% immunity against infection.4,5 In some countries it is recommended for people 60 years of age or older, since they are at greatest risk of suffering complications of shingles.